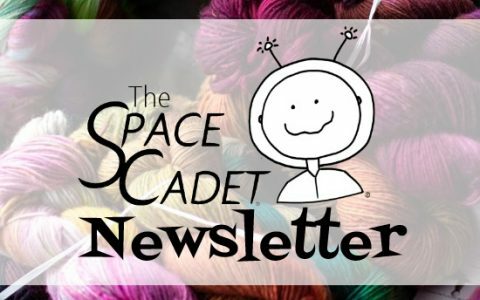 At SpaceCadet, we passionately believe that knitting and crocheting makes people happier — deep down inside — and nothing does that more than working with gorgeous, vibrant yarn. For us, dyeing is a cosmic adventure — a wonderful process of mixing each colour by hand and seeing where it takes us. The result is yarn that is as exciting for you as it is for us. We make it so easy to choose your colours! Amazing Colour Combos in Easy Kits! An awesome hat with dozens of variations! You like rainbows... but you also like grey, right? 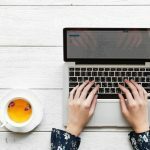 Why SpaceCadet? When I was a kid and I’d do something dumb (the way kids do), my dad used to call me “space cadet”. It was always said with love, tinged with exasperation. There was a lot of love in the house while I was growing up, but I also did a lot of dumb things. Eventually the nickname started to stick, and I began to feel like I really was a space cadet. Sometimes I still do. So I decided a long time ago that when I finally broke out of the mould of ordinary work to do something creative — something I wanted to be proud of — I was going to name my project “SpaceCadet”. I would baptise that nickname with a whole new meaning. I love what I do. I love creating colours, creating yarns, and giving my customers something beautiful to feed their creative juices. And so I can say, at last, that I am truly proud to be the SpaceCadet. 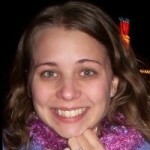 Stephanie has been fascinated by fiber ever since she first took spinning lessons at the age of 11. 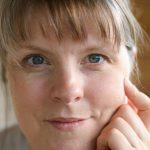 She taught herself to knit at 19, went back to spinning (and actually got the hang of it) ten years later and, along the way, picked up a bit of experience in weaving, a smidge of crochet, and a degree in Textiles and Clothing. But it was when she began dyeing that she felt she’d really found her calling. She has lived half her life in the US and the other half in the UK, which explains her spelling. She lives in Pittsburgh, PA, with her husband and two daughters. She’s SpaceCadetCreates on Ravelry, @SpaceCadetYarn on Instagram, and you can contact her here. Jade has a never-ending positive attitude and an excellent eye for colour (and she’ll gladly tell you she wasn’t hired for her math skills). An art education major at university, she brings all her artistic background to the dyepots, to her doodles on the notes she keeps during meetings… and to her forearms, which she uses as notepads when she runs out of paper. A knitter since 2006, Jade’s always got something on her needles — and that something usually ends up as a sample in our booth! She’s Pittsburgh born and bred, and spends her days herding two wee daughters and a husband. It’s Cathy you’re emailing when you contact us at missioncontrol (at) spacecadetyarn (dot) com. 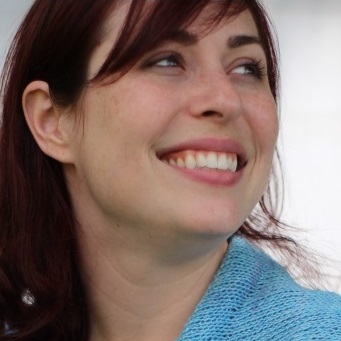 She’s caring, calm, and meticulous about details — and we couldn’t ask for a genuinely nicer person to answer your questions and manage the club subscriptions. You can ask her anything about SpaceCadet and, if she doesn’t know the answer off the top of her head, she’ll go find out for you! 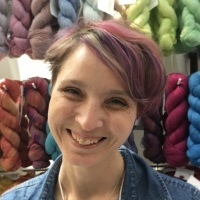 Jill works quietly behind the scenes to turn our full-size skeins into adorable Minis for the Mini-Skein Club, and then to twist, tag, and bundle them ready to out to our club members. Jill’s mad for purple, cables, and zebras, but usually combines only two out the three. A native of Erie, she now lives in Pittsburgh with her husband and son. Sara packs our parcels, twists our skeins, alphabetizes our tags …and starts to twitch if the studio gets too messy. Super-quiet on the outside, she’s straight-to-the-point and witty on the inside — and an indispensable part of what keeps SpaceCadet going. She was born and raised in the mountains of Colorado, and spends her days hauling around three boys and a trunk full of hockey gear. Hey, put down those needles and get in touch — we’d love to hear from you! We are usually available to reply within a day or two during the work week. But we are a very small operation, so it may take longer when we’re away at yarn shows, during holidays, or if we’re up to our elbows in dye out in the studio! 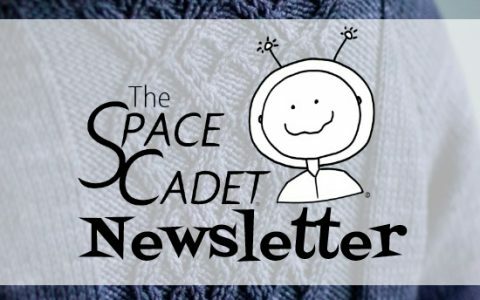 Got a question about how to use SpaceCadet® yarn, patterns or needle sizes? 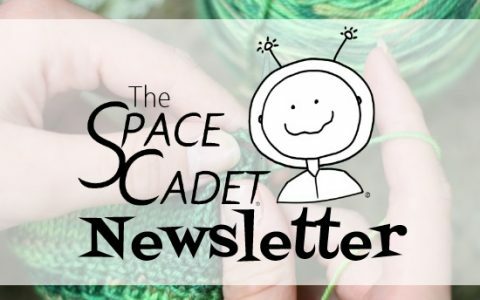 The very best place to get answers is the SpaceCadet® group on Ravelry. 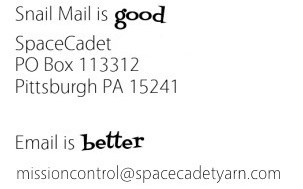 Lots of great folks who love to use SpaceCadet® yarns will be glad to help you out. Click here to check it out! Got a question about Gift Certificates, Shipping, Refunds, or International orders? We’ve probably answered it in the FAQs — click here to read them. Got a question about your Mini-Skein Club Subscription? Click here to check out the Club FAQs and get your answer fast! SpaceCadet® wholesales through select retailers, and we welcome new enquiries. 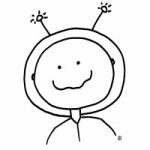 For more information about SpaceCadet® wholesale, please click here to give us your details, and we’ll be in touch asap. If you are already a wholesale customer, click here to access the latest information on our password protected wholesale page.